Cruella de ville. 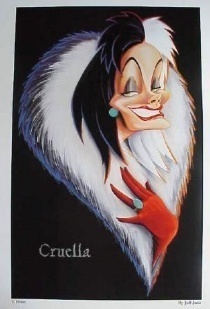 A portrait of cruella de ville from disney's 101 dalmations.. Wallpaper and background images in the क्लॅसिक डिज़्नी club tagged: classic disney animated film 101 dalmations cruella de ville image. This क्लॅसिक डिज़्नी photo might contain मोबाइल फोनों के लिए, हास्य पुस्तक, मंगा, कार्टून, एनीमे, कॉमिक बुक, manga, चित्र, headshot, closeup, हेडशॉट, and क्लोज़अप.